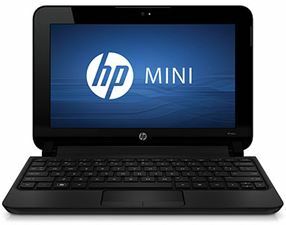 In order to tap the business market, HP has announced an affordable and lightweight netbook which is known as HP Mini 1103. The HP Mini 1103 has been created with modern design and featured with 10.1-inch diagonal LED-backlit WSVGA display with 1024 x 600 resolutions and powered by either an Intel N455 or N475 processor. The modern design netbook supports up to 2GB of RAM and comes with Intel GMA 3150 graphics. The HP Mini 1103 is preloaded with Windows 7 starter edition, SUSE Linux Enterprise 11 or FreeDOS. It boasts a 160,250 or 320GB hard disk with 7200rpm, has built-in three USB 2.0 ports, Ethernet, VGA, a microphone port, a headphone port, integrated with 802.11 b/g/n WiFi, Bluetooth 3.0+HS enabled and a 93% full-size keyboard. In addition, it comes with a three cell or six cell battery. Available in black, the HP Mini 1103 with dimensions of 10.55 x 7.52 x 0.89 inches and weighs 2.78 pounds is expected to be available later this month with the price start from $299.